It’s Time for the “Te-Vick” Offense in Kansas City: The Chiefs Gameplan for 2013. | Digital Marketing, Poetry, Reviews, Philosophy, Sports & Tales by Joe Wooldridge. 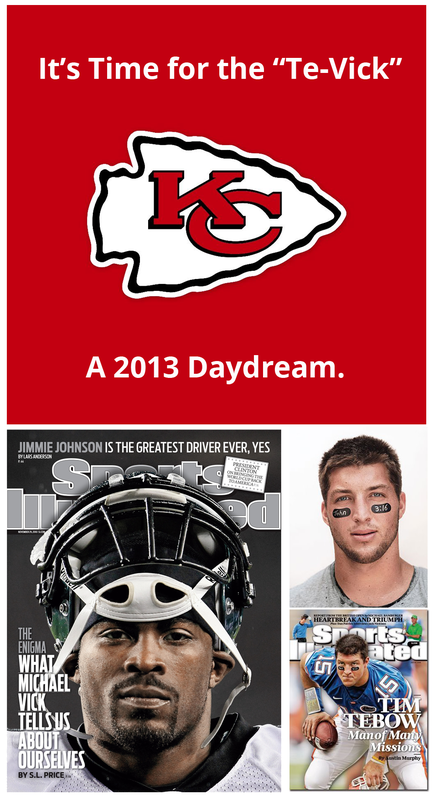 It’s Time for the “Te-Vick” Offense in Kansas City: The Chiefs Gameplan for 2013. How to fix the Kansas City Chiefs in 2013? Here’s a plan. Oh, if they made me the decision-maker for the Kansas City Chiefs, here is what I would do. Some would hate it. Most would LOVE it. ALL would watch it. I’d sure love to see it. The “Te-Vick” Offense = a nightmare for opposing defensive coordinators. A run-based offense of ground and pound running game with the backfield featuring Vick, Tebow and either Charles or a Fullback. No one is built to stop this type of attack anymore in today’s pass-happy NFL. No one will adjust their defensive personnel to stop just ONE TEAM on their schedule. Teams will HATE playing us because we’re physical. Defensive personnel are predominantly lighter, faster guys who are drafted for their speed and ability to cover receivers will get bulldozed and will start to wish they were somewhere else at about the 3:00 mark in the 3rd Quarter. Interest and Media Coverage would be INTENSE. If the first year is a sour one, then use our high draft pick in 2014 on Johnny ‘Football’ Manziel. Clark Hunt, here is your winning plan. It wins. It is relevant. Fans will love it. Jerseys and merchandise will sell like hotcakes. Arrowhead will once again be the biggest and best BBQ party on the planet.